Yesterday, August 4, 2009, Louisville, Kentucky was hit with a powerful thunderstorm that left inches of rain behind in a very short period of time. Some estimates were up to 7 inches within an hour. The rain stopped for a while, then it came again. Louisville had no shortfall of rain prior to this and there simply was no place for all of this water to go, so it chose to run down streets, flood parking garages, homes, businesses and university classrooms, and dump several feet of muddy water into the local downtown library. Today, the Louisville Free Public Library, is pumping and mucking out water and sludge. In it's wake, is an estimate of upwards of a million dollars in damage. 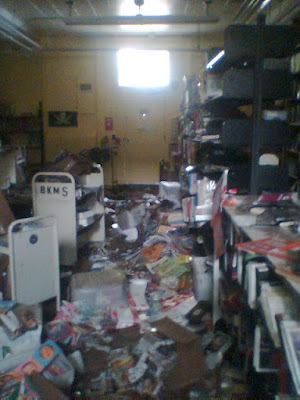 This damage not only includes books, but computers and other technology equipment destined for the Newberg Center. It includes the library technology server, the air conditioning and heating systems, the electrical system, and more. My heart breaks at the loss of the books and other library equipment. Just seeing the books floating in the murky water touched something in me. I want to do something, so today I contacted The Library Foundation for what I could do to help. According to Mary Hunt, of The Library Foundation, the most urgent needs are for cash donations. Perhaps later, there will be a need for book donations and other kinds of support. So for now, this is where I start. This is a start. I have other ideas for support and will be keeping in touch with The Library Foundation. I welcome your ideas, as well. Stay tuned. Maddie, this picture makes me cry. I'm sure the ladies on this end could pitch in with something if you have any ideas. Fonda can put together AWESOME door prize baskets. 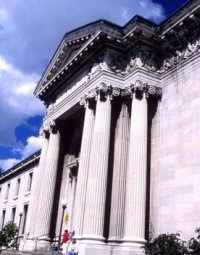 Library Update: The news this morning reported that the damage is above 5 million dollars now. The downtown branch and one other remain closed. The computer systems are still out for all of the libraries.